What determines which countries and firms receive capital from foreigners and benefit from capital account liberalisation? Are cross-border capital flows allocated similarly to domestic investment? A large literature has studied related questions in the context of equity portfolios. For example, home-country bias – the finding that investors disproportionately hold securities issued by domestic firms – constitutes one of the most robust patterns in global portfolios (French and Poterba 1991). But data limitations have left international bond portfolios largely unexplored, even as international bond investment has grown rapidly. We obtained from Morningstar the security-level details on nearly $27 trillion in positions held by mutual funds around the world, and bring these micro data to bear on these and related classic questions in international finance and macro. We find that the currency in which bonds are denominated plays a critical role in determining which firms get foreign capital and in shaping the global distribution of cross-border flows. In recent work, we demonstrate that investors exhibit a bias toward corporate bonds denominated in their own currencies, even when borrowing from developed countries with a strong rule of law, low inflation, and fully liberalised capital accounts (Maggiori et al. 2018). This home-currency bias is so strong that the currency of denomination of the assets has more predictive power in our data for who holds which bonds than does the nationality of the issuer, the focus of a voluminous literature on home-country bias.1 In much the same way that the finding of home-country bias led to its use as a critical calibration target for models in international macro and finance, we believe that models aiming to capture the external wealth transfers associated with currency movements and other key dynamics in open-economy frameworks, must also aim to generate the critical sorting by currency that we document. This pattern holds for all issuing countries in our dataset in 2015 except one – the US. Unlike firms in other countries that issue only in their local currencies, US firms that issue only in US dollars are able to place their debt into foreign and domestic portfolios with comparable ease. Indeed, the US is the only country where, in terms of both the currency composition and the share of investment going to each borrowing firm, foreign and domestic investment portfolios in its corporate sector’s debt are largely similar. We view this finding as offering a novel perspective on ‘exorbitant privilege’. Rather than focus, as an extensive literature has, on the extent to which the US government’s borrowing costs are lower than would otherwise be, we show that this privilege allows firms to borrow from abroad without paying the costs associated with foreign currency issuance. In a sense, we offer a fresh perspective on what an international currency can do for the country that issues it – it opens up the capital account for local-currency-only borrowers. While the dollar has played a central role in the global economy since at least Bretton Woods, we uncover a striking trend in the dollar’s use that emerged in the last decade. 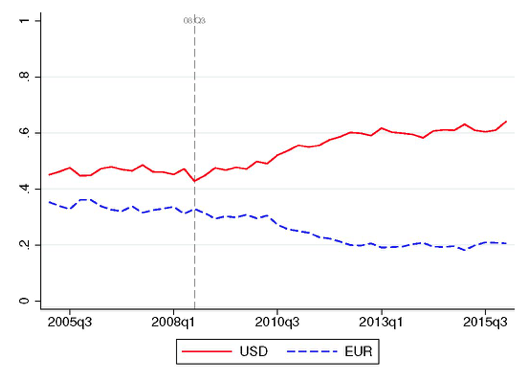 As shown in Figure 1, whereas the euro and dollar were used to denominate comparable shares of cross-border corporate bond portfolios in our data during 2005–2007, the dollar’s share surged and the euro’s collapsed since the global and euro area crises of 2008–2010. A growing literature is developing models of competing international currencies (Farhi and Maggiori 2018, He et al. 2018, Stein and Gopinath 2018), and should aim to elaborate on the cause of this shift, whether due to uncertainty about the euro’s future or the increased benefit of holding dollar assets (as collateral, due to liquidity, or otherwise). Our work shows that the currency of denomination of assets deserves more attention in international macroeconomics than has been the case thus far. Academics, investors, and policymakers alike should take note of how international currency status can change rapidly because of the important implications such a change can carry for the global allocation of capital. Boermans, M A and R Vermeulen (2016), “Newton meets Van Leeuwenhoek: Identifying international investors? Common currency preferences”, Finance Research Letters 17: 62–62. Burger, J D, F E Warnock and V C Warnock (2017), “Currency matters: Analyzing international bond portfolios”, NBER, Working paper 23175. Coeurdacier, N and P-O Gourinchas (2016), “When bonds matter: Home bias in goods and assets”, Journal of Monetary Economics 82: 119–137. Engel, C and A Matsumoto (2009), “The international diversification puzzle when goods prices are sticky: It’s really about exchange-rate hedging, not equity portfolios”, American Economic Journal: Macroeconomics 1(2): 155–188. Farhi, E and M Maggiori (2018), “A model of the international monetary system”, The Quarterly Journal of Economics 133(1): 295–355. French, K R and J M Poterba (1991), “Investor diversification and international equity markets”, American Economic Review 81(2): 222–226. Gopinath, G and J Stein (2018), “Banking trade, and the making of a dominant currency,” NBER, Working paper 24485. He, Z, A Krishnamurthy and K Milbradt (2018), “A model of safe asset determination”, American Economic Review, forthcoming. Maggiori, M, B Neiman and J Schreger (2018), “International currencies and capital allocation ”, NBER, Working paper 24673. Van Wincoop, E and F E Warnock (2010), “Can trade costs in goods explain home bias in assets?” Journal of International Money and Finance 29(6): 1108–1123. Consistent with this, Burger et al. (2017) found, using TIC data, that US foreign investment across destination countries does not appear home-country-biased in the subset of debt that is dollar-denominated, and suggested it might apply more generally across countries and debt markets. See also Boermans and Vermeulen (2016). We emphasise that, while some mechanisms discussed in the literature can generate home-currency bias (Van Wincoop and Warnock 2010, Engel and Matsumoto 2009, Coeurdacier and Gourinchas 2016), they alone will not generate such a skewed allocation of capital across borrowers. Rather, the logic laid out in those papers would leave cross-firm lending undistorted, with investors simply using forward contracts or other derivatives to undo any undesired currency exposures found in their overall portfolios.